Home / News / Balkan / WORLD’S BEST HANDBALL PLAYER 2013: DOMAGOJ DUVNJAK! WORLD’S BEST HANDBALL PLAYER 2013: DOMAGOJ DUVNJAK! Handball-Planet.com is pleased to announced the results of Voting Contest for the World’s Best Handball Player 2013. Croatian playmaker and German HSV star Domagoj Duvnjak (26) has got the highest number of points based on cumulative votes of the 11 members of the international Jury and Handball-Planet.com visitors. His fantastic performance in HSV’s campaign of winning the VELUX EHF Champions League last June and main role in the succesful Croatian NT during WCH 2013 in Spain, were the biggest reasons why handball community elected him for the prestigious award. In the three weeks of voting period amazing 144.851 votes for 21 nominated players have shown the outstanding interest for our project the third year in a row. Duvnjak, who will change his T-shirt next summer after signing for THW Kiel, joined the prestigious company of Laszlo Nagy and Filip Jicha – winners in 2011 and 2012. Next Story → HANDBALL WORLD UNITED: 144.851 votes for the World’s Best Player 2013! Duvnjak to miss Play-Off matches for WCh 2019 – Sliskovic is back! 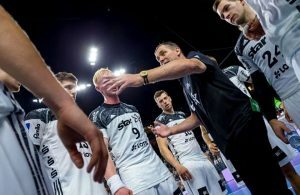 ONLY 16 GOALS FOR HOME TEAM: THW Kiel storm over Leipzig! How many time is duvnjak be the Best player?